Advanced Subnet Calculator 8.0 free download. Finally, a Calculator with teeth! Are you tired of a Subnet Calculator with limitations? Other Subnet Calculators only do one function, don't allow Exporting, or require you to purchase to enable all the features. Finally, a Calculator with teeth! Are you tired of a Subnet Calculator with limitations? Other Subnet Calculators only do one function, don't allow Exporting, or require you to purchase to enable all the features. Finally, a Calculator with teeth! Are you tired of a Subnet Calculator with limitations? Other Subnet Calculators only do one function, don't allow Exporting, or require you to purchase to enable all the features. The Advanced Subnet Calculator from SolarWinds is COMPLETE and FREE. The Advanced Subnet Calculator is a free and useful program that comes with four tools in one. Forward and reverse DNS resolution, response time, Address translation (Hexadecimal and Binary) and Address Class information. Also supports resolution of IP Address owner. Full Function Subnet Calculator. No limited functionality! Calculates subnets based on Subnet Mask, Mask Bits, Host Bits, Number of Subnets and Hosts per Subnet. You can then generate a range of subnets based on these settings. Includes full Support for Inter-Domain Routing (CIDR). Use of CIDR addresses reduce the size of routing tables and make more IP addresses available within organizations. Will generate a list of addresses for any subnet. This can then becomes the working document to assign addresses. 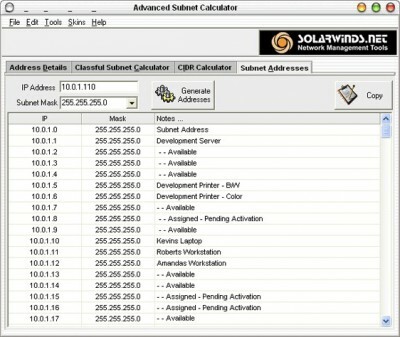 You can even assign addresses within SolarWinds Advanced Subnet Calculator and then print the worksheets . . . or Export to HTML or Excel. The SolarWinds Wake-On-LAN is a free and useful application which has the ability to "power on" a PC remotely. Advanced IP Address Calculator is an easy-to-use IP subnet calculator that lets you to calculate every aspect of your subnet configuration in a few mouse clicks! The calculator generates a color-coded bit map, breaking down the network, subnet, and host portion. LanCalculator � makes possible not only to easily calculate the subnet addresses range and subnet masks but also broadcast address, net address, net prefix and net mask inversion which is used in the access control lists (ACL) of Cisco network equipment. Subnet ScanPro a solution for network professionals who need computer inventory data. DhcpExplorer can be used to to discover DHCP servers on your LAN or local subnet. Dhcp Explorer tool allows you to discover DHCP servers on your local subnet or LAN. SemSim brings to you effective CCNA study material and courseware that drives real results! SemSim CCNA Training Course makes your CCNA study easy. Colasoft MAC Scanner is a scan utility used for scanning IP addresses and MAC addresses in a local network.